Prescription for Bankruptcy | Omni Publishing Co.
A Doctor’s perspective on America’s failing health care system and how we can fix it. 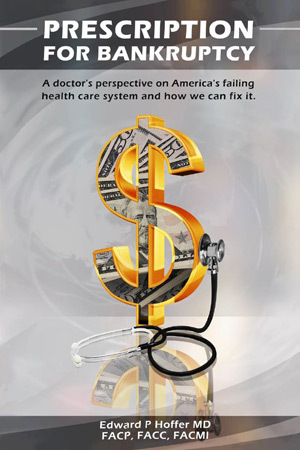 In Prescription for Bankruptcy, Dr. Edward Hoffer, a graduate of MIT and Harvard Medical School with more than 40 years of medical experience, examines every segment of the American health care system and describes their contribution to the ever-growing costs that negatively affect health care in America. Not only does he identify the many cost issues, he offers solutions to dramatically reduce these costs and improve health care in America. A doctor’s visit will never be the same for readers of this book. Dr. Hoffer offers practical ideas that will empower everyone to take more control over their health care and related expenses.